What is one of the most important components if you want to improve your abilities as a music producer? Studio owners may invest a lot in speakers, midi equipment and instruments but let’s not forget the item you’ll probably wear constantly: your headphones. 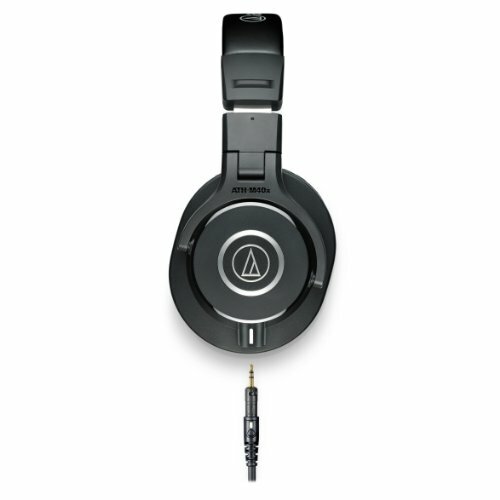 Is the Audio Technica ATH-M40x a model that should be on your shopping list? We checked it out to help you make your decision on which headphones to trust. A quick glance is often enough to gauge a component’s worth. Do these features rank high on your priority list? So what sets this set of headphones apart from all the other models you could select? This set is specifically designed for music producing – that’s what the 90° swivel of the earpieces and long cables are for. This swivel effect also allows the set to collapse in on itself for safe storage so nothing can damage the insides of the earpieces. Alternatively, you can simply plug out the cable and plug in your friend’s cord since this isn’t permanently fixed to the set. It has a sturdy design which serves consumers well who use their equipment on a daily basis. For wearing it for long periods of time you’ll appreciate the comfortable fit. Sound quality is produced by 40mm drivers and distortion is countered with copper-clad aluminum wire voice coils & rare earth magnets. Thanks to the headband and earpads all covered in high-quality materials your comfort is enhanced. The pair will also isolate sound with the circumaural contours on the earpieces. This makes them mostly usable in unique, loud environments such as live gigs or for listening to your tracks while using public transport. Is this the perfect set of headphones you’ve been looking for? Let’s investigate. Here the set scores pretty high since you can easily switch the connection between ¼”and 1/8” types. You can even disconnect your cable completely to plug in a new one or someone else’s instead of being limited to a fixed cable. Unfortunately, it’s not manufactured with Bluetooth connectivity which would make you more mobile around the studio. You could try and add Bluetooth with converters, but those systems don’t always work 100%. Does the brand provide you with comfort features? Definitely yes: The headband and ear pieces are all covered in soft fabric. The earpieces fit comfortably around the ears which is a way of shutting out the noise and also makes for comfortable wearing. Your comfort will depend on the size of your head. The clamping is quite tight so someone with a large-sized head may feel too much pressure if the set is worn for a long period. First off, the design and absence of a microphone mean it’s not really a gaming set. The reasonable price tag means you could consider this for home listening if you’re after quality audio. These are most definitely for the studio but not only because they produce such clear audio. We found the swivel function of the ear pieces make it super easy to mix with one ear which many professionals prefer. As a bonus, you can have a visiting client get an idea of the masterpiece you’re creating by having them listen to while you carry on working. They’re also made for taking your music on the road. You don’t want your gear to get damaged and these neatly collapse to fit into a protective bag. No more distortion because your gear was damaged during travel, simply pack your headphones and laptop and start creating amazing tracks with traveling on trains, planes and automobiles. Note that they’re not ideal to go exercising with. They’re bound to slide down even if they feel tight on your ears at the start of your session. They’re simply not made to stay in place while you move around a lot. They’re also not completely noise canceling. The brand doesn’t claim that they are so this is your first clue that they definitely aren’t. They will isolate some sound and those around you won’t hear everything you hear, but you’ll have a sense of what’s going on around you. This could be distracting if you’re working. For studio work where you’re mostly alone though these will suffice. We already mentioned that they can collapse and the brand provides you with a custom made bag for storage purposes. A case would have been an even better option in terms of protecting the set but the padded bag is easy to fit into your luggage. For optimal usage of any sound gear you need cabling. We love that the cord isn’t permanently attached so you can remove it if you need to. That means it won’t get damaged as easily during transportation or if you prefer a different one you can use it easily. Luckily, the cable is supplied so it’s not an additional expense, but we’re even more impressed that the brand caters for musos or producers with different tastes. You get one coiled cable which limits those irritating tangles with other cords in your system. However a straight cable is also included. What’s your preference? Both are 3 meters long when stretched out. The brand does think of all scenarios because it even gives you a ¼” screw-on adapter. The one thing it doesn’t come with standard is a mic. This makes it much more of a producing set of headphones than gaming equipment. Headphones are used on a daily basis and often travel with musos or producers. Purchasing a pair that will quickly break is a waste of money, and they’re bound to go through some rough handling no matter where you use them. This pair should live up to high expectations thanks to the sturdy construction and also the fabric. Audio Technica used professional-grade material so it won’t easily crack or peel off. In the headband you’ll find steel reinforcement which gives the unit a longer lifespan. The construction will also survive many hours and times of swiveling those ear pieces in the direction you need them to be. Note that the joints do feel somewhat flimsy so try and work with care as far as you can. This is probably the most important thing, right? What’s important is that you’ll get balanced audio through this set. Mids, highs and even bass frequencies will come through clearly, even as low as 20Hz. Some users complain about inconsistencies but this could be attributed to the wearing of glasses which automatically alters the headphones’ capabilities. Is this the best option for you? If you’re looking for a way to listen to audio in a critical aspect you’ll enjoy these in the studio for mixing and tracking. Depending on the setup, you could use them if you’re a DJ, or a music producer of any style and genre. As stated, their usefulness dwindles when you exercise with them or use them in loud environments, so basically these are really designed to produce music, Dj, or listen back to your tracks after that have been mixed down. 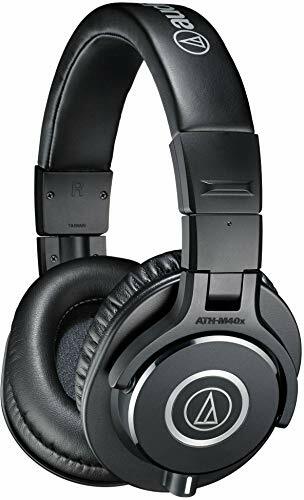 A similar unit you can consider is the Audio Technica ATH-M70x. This one from the same brand has higher input power and better frequency response. This could be what you need if you’re mastering a track, which calls for absolute accuracy and no distortion. However this one doesn’t collapse so you can’t really take it with you everywhere. If noise cancelling is what you’re after you can look at the COWIN E7. It’s also battery driven and Bluetooth enabled so you can take it on the road. Will they be as dynamic for precise studio work? Not likely. They can also become hot and should be taken off every two hours according to the manufacturer. This isn’t very practical for a day in the studio. This is more a style statement for casual listening. If you’re shopping on a budget you can look at the AKG K240STUDIO Semi-Open Studio Monitor Headphones. They offer many professional features but are slightly less expensive than the ATH-M40x. However you may have to sacrifice in terms of frequency response and quality of the structure. It comes down to what’s featured on your priority list. Can it be improved? Yes. Is it a sensible buy for a studio owner?